An increased front-to-back curve of the upper spine is called kyphosis. 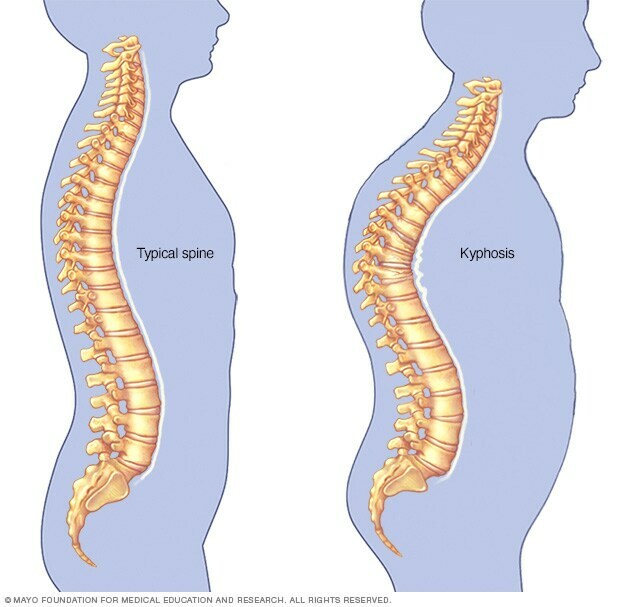 Kyphosis is an exaggerated, forward rounding of the back. It can occur at any age but is most common in older women. Age-related kyphosis is often due to weakness in the spinal bones that causes them to compress or crack. Other types of kyphosis can appear in infants or teens due to malformation of the spine or wedging of the spinal bones over time. Mild kyphosis causes few problems. Severe kyphosis can cause pain and be disfiguring. Treatment for kyphosis depends on your age, and the cause and effects of the curvature. Mild kyphosis may produce no noticeable signs or symptoms. But some people experience back pain and stiffness in addition to an abnormally curved spine. Make an appointment with your doctor if you notice an increased curve in your upper back or in your child's spine. The individual bones (vertebrae) that make up a healthy spine look like cylinders stacked in a column. Kyphosis occurs when the vertebrae in the upper back become more wedge shaped. Fractures. Broken or crushed vertebrae (compression fractures) can result in curvature of the spine. Mild compression fractures often don't produce noticeable signs or symptoms. Scheuermann's disease. Also called Scheuermann's kyphosis, this disease typically begins during the growth spurt that occurs before puberty. Boys are affected more often than girls. Birth defects. Spinal bones that don't develop properly before birth can cause kyphosis. Breathing problems. Severe kyphosis can put pressure on the lungs. Limited physical functions. Kyphosis is associated with weakened back muscles and difficulty doing tasks such as walking and getting out of chairs. The spinal curvature can also make it difficult to gaze upward or drive and can cause pain when you lie down. Digestive problems. Severe kyphosis can compress the digestive tract, causing problems such as acid reflux and difficulty with swallowing. Body image problems. People with kyphosis, especially adolescents, may develop a poor body image from having a rounded back or from wearing a brace to correct the condition. For older people, poor body image can lead to social isolation. Kado DM. Overview of hyperkyphosis in older persons. https://www.uptodate.com/contents/search. Accessed April 14, 2018. Frontera WR. Scoliosis and kyphosis. In: Essentials of Physical Medicine and Rehabilitation: Musculoskeletal Disorders, Pain, and Rehabilitation. 3rd ed. Philadelphia, Pa.: Saunders Elsevier; 2015. https://www.clinicalkey.com. Accessed April 14, 2018. McCarthy J, et al. Diagnosis and management of vertebral compression fractures. American Family Physician. 2016;94:44. Kyphosis (roundback) of the spine. American Academy of Orthopaedic Surgeons. http://orthoinfo.aaos.org/topic.cfm?topic=A00423. Accessed April 15, 2018. Azar FM, et al. Scoliosis and kyphosis. In: Campbell's Operative Orthopaedics. 13th ed. Philadelphia, Pa.: Elsevier; 2017. https://www.clinicalkey.com. Accessed April 14, 2018. Nigrovic PA. Back pain in children and adolescents: Causes. https://www.uptodate.com/contents/search. Accessed April 14, 2018. Schwartzstein RM. Chest wall diseases and restrictive physiology. https://www.uptodate.com/contents/search. Accessed April 14, 2018. Brown A. Allscripts EPSi. Mayo Clinic, Rochester, Minn. Sept. 19, 2017. Shaughnessy WJ (expert opinion). Mayo Clinic, Rochester, Minn. April 30, 2018.